Am I required to have a maintenance contract? Yes, it is a Brazos County law that you must keep up a valid maintenance contract at all times. If the County finds that you are not under contract, it could result in a court date and fines up to $500. What should I do if I’m buying a house with a septic system? When buying a home with a septic system you should request to have the system cleaned out and inspected. You want to start fresh in your new home by having the system cleaned out, and having an inspection done will ensure that the septic system is in good condition. If the system is not up to code or there are problems with it, the inspection will give you a chance to negotiate the proper repairs before closing on the property. What can I do to prepare for large gatherings during the holidays? Having a large number of people over for gatherings can be hard on your septic system. An aerobic system is designed for the size of the house and the number of people who live there. Large parties can easily overload the system and cause problems if your system is already getting full. To avoid any embarrassing situations, have your system checked and possibly cleaned out before the holidays. Should my septic system be making a noise? Your aerator will make a constant humming noise. But, if you hear a loud buzzing sound that means your septic alarm is on. First you should check your breakers to make sure power is getting to your system. If the breakers have not been tripped, call ASIM immediately. If the alarm is on, there is something wrong that should be checked out. Is my Aerobic system supposed to run all the time? Yes, your aerobic septic system is intended to run constantly. 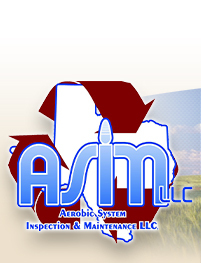 If your aerator or spray pump is not running, contact ASIM. Do I have to add chlorine to my aerobic system? Yes, it is the law. You must maintain a chlorine residual in your system at all times. Violating this law can result in a fine of up to $80 per day. The only way that the wastewater can be treated is for chlorine to be in the system. So, if you are not adding chlorine, it is spraying out untreated water. Where can I get chlorine tablets? Most larger home improvement stores carry septic chlorine tablets. You can also purchase a 10 lb bucket from ASIM. A 10 lb bucket typically lasts close to a year. If you buy a larger bucket, the moisture will begin to break down the remaining tablets in the bucket and they will go bad before you can use the whole bucket. Also, make sure you ONLY buy SEPTIC chlorine. DO NOT use Pool chlorine tablets. These tablets are made differently and can react with gas and byproducts in your septic system and have been known to explode. Why does my aerobic system smell bad? Some people are more sensitive to septic smells than others. If you are experiencing a sewage smell, that does not mean you need to add more chlorine to your system. This is typically a sign that your aerator is out or there is an aeration problem. Should the alarm and sprayers keep coming on during and after rain? Septic systems typically take in ground water when it rains. This can cause the water level to rise and trigger the high water alarm and sprayers. After the rain stops and water soaks in or runs off, most systems will correct themselves. If you still have a problem, call ASIM. Should my sprayers keep coming on during an ordinary day when there is no rain? If there is no rain water to raise the water level in your tanks, and your sprayers are going off frequently during the day, this is a sign of overloading or a plumbing problem. If you use too much water for the system to handle, it will spray. Also, if your sprayers are going off frequently and you are not using water in the house, check for leaking faucets or leaky/running toilets. This will add to the water level. SEPTIC SYSTEMS DO NO MAKE WATER. If the sprayers are spraying, something is adding water to the system. Since my septic system runs continually, will my electric bill go increase? No, an aerobic septic system uses about the same amount of electricity as a 100 watt light bulb. If there is a bad odor inside my house, that is a septic problem, right? No, septic odors inside the house are typically from a plumbing problem. A plumber is responsible for the area under the house, we are responsible for the area from the cleanout to the system. How do I mute the alarm? There is a button marked on your control panel box to mute the alarm. Anytime you mute the alarm, you should call your septic maintenance company. The alarm comes on for a reason and it should be addressed sooner than later. What can I do if my neighbor’s septic system stinks? If your neighbor has a smelly septic system and doesn’t appear to care or try to fix the problem, you can make an anonymous complaint to the Environmental Health Services division at the local Health Department. What to do if my electricity is out? If your septic system is a conventional system and no pumps are used everything should be normal. However, if you depend on a pump to move your treated water to another tank, disposal area, or if you have an aerobic septic system with surface spray disposal you should minimize water usage during the interruption in electrical service. Once electric service has been restored you may encounter a period of an alarm indicating there is too much water in a tank and after some period of time, which will vary from system to system and usually an hour or less, the alarm should clear itself and everything should return to normal. What can I do if my drains and toilet flushes are slow? Unfortunately during bad weather conditions there is not much anyone can do but if there is no electricity for a long period of time or the rains have caused some degree of flooding things could get backed up. The best thing to do is minimize water usage. If this does not help the last resort would be to locate your sewer clean-out. advise caution when doing this, and remove the cap. Weather conditions may prove to prohibit this procedure and also there could be pressure on the cap which could spray you with raw sewage. Taking the cap off will help relieve the possibility of a sewer backup in the house and let it go outside instead. Once the weather subsides and electric service restored and everything has returned to normal be sure to have your sewer clean-out cap replaced. Your septic service provider should assist you if needed. If your installer is a licensed septic contractor in the area, he should know exact guidelines for your home, usage, and locality. Or you can check with your county health department. This is never advisable and is against most municipal codes. Do not build any additions, pools, or driveways over a tank. Also, do not build or plant on top of your drainfield. What are the major dos and dont’s of maintaining a trouble-free system? · Conserve water to reduce the amount of wastewater that must be treated and disposed. · Repair any leaking faucets and toilets. · Only discharge biodegradable wastes into your system. · Restrict garbage disposal use. · Divert down spouts and other surface water away from your drainfield. · Keep your septic tank cover accessible for tank inspections and pumping. · Have your septic tank pumped regularly and checked for leaks and cracks. · Call a professional when you have problems. · Compost your garbage or put it in the trash. · Flush sanitary napkins, tampons, disposable diapers, condoms, wipes, and such products into your system. · Dump solvents, oils, paints, thinners, disinfectants, pesticides, or poisons down the drain. They can disrupt the treatment process and contaminate groundwater. · Dig in your drainfield or build anything over it. · Plant anything over your drainfield except grass. · Drive over your drainfield or compact the soil in any way.